Computational Fluid Dynamics (CFD) software programs compute fluid flows (such as gases or liquids). The input is boundary conditions, such as the known properties of the gas on boundary surfaces surrounding the problem space (time-dependent problems also include the starting conditions at time t=0). The output are gas properties within the bounded volume, such as pressure, temperature, velocity, and density as functions of position (and time if time-dependent), typically represented as volume meshes. The CFD computation is based on the Navier-Stokes equations (or, more simply, inviscid Euler equations). There are many approaches to CFD computation based on what gas flow conditions are assumed in the Navier-Stokes equations and how the meshing and solving are done. In general, CFD can involve complex interactions of various parameters and be computationally intensive, with various degrees of difficulty depending on fluid dynamics factors, such as whether the flow is time-dependent or steady state, turbulent or laminar, viscous or inviscid, supersonic/compressible or incompressible, 3D, or constrained in some way (e.g. constant temperature). Fig. 65 Virtual Device Hydrodynamics screenshot showing calculated gas flow (speed) from a high speed jet and then through a skimmer cone. SIMION is not itself a CFD program. 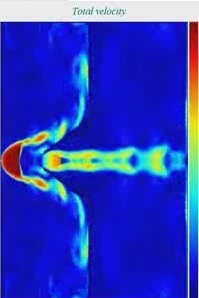 However, it can utilize gas flow data from other CFD programs for the purpose of particle tracing in those gas flows (see Ion-Gas Collisions), combined with SIMION computed electromagnetic fields. Some users have used programs like Fluent, ANSYS CFX, and various others. Moreover, the third-party Virtual Device Hydrodynamics program (“Virtual Jet”), which specializes in computation of supersonic/compressible gas flows (such as in ESI sources) over wide pressure ranges, includes special optional functions for integrating with SIMION, including exporting its calculated gas flows directly to regular SIMION PA files for use in SIMION, a custom SIMION workbench user program for integrating those flows into SIMION particle tracing, and a 3D editor that can define not just the boundary conditions for the gas flow calculation but also simultaneously the electrode geometries for the SIMION electric field calculation (exporting them as GEM files).